Let the power of Catholic prayers help you. "You can't explain it, you must experience prayer." When you are faced with problems and need help, Jesus can be your best friend. Most people, and I include myself, take years to realize that prayer and love for Jesus is the way to a better life. A recent study by the London School of Economics and Erasmus University Medical Center found that the secret to sustained happiness is participation in religion. "The church appears to play a very important social role in keeping depression at bay and also as a coping mechanism during periods of illness in later life." Jesus loves you. No matter what you are struggling with, when you need help, ask Him. Talk to Jesus every day in prayer; it will bring you closer to Him. Comeaside gives you ways to spend Quiet Time with Jesus. 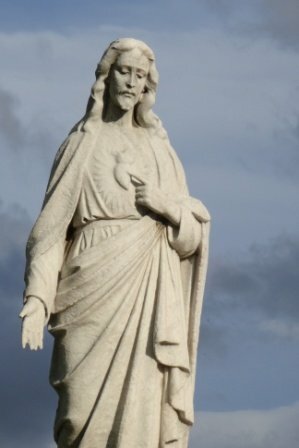 You will find the Devotion to the Sacred Heart and a way to say the rosary online. There are prayers to help you handle loneliness and depression, heal relationships, and deal with illness and other personal problems. There are also links to Catholic prayer and music and Bible sites that will help deepen your relationship with Jesus. You will feel His presence in your life. You will have a better friendship with Him, and a better life for yourself.